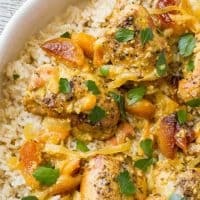 Slow cooker apricot chicken is an easy recipe using chicken thighs and dried apricots for a delicious dinner with big, fresh flavor and an intoxicating aroma – your house will smell amazing! Oh, you guys… potty training with J this weekend was an epic fail. Little man tried hard and we certainly went potty about a thousand times, including several extended stays. But alas, he didn’t take to it. At all. Anyone else get giddy when your house fills up with the aroma of what you’re cooking and you can almost taste it as you begin to salivate, like a Pavlov reaction? 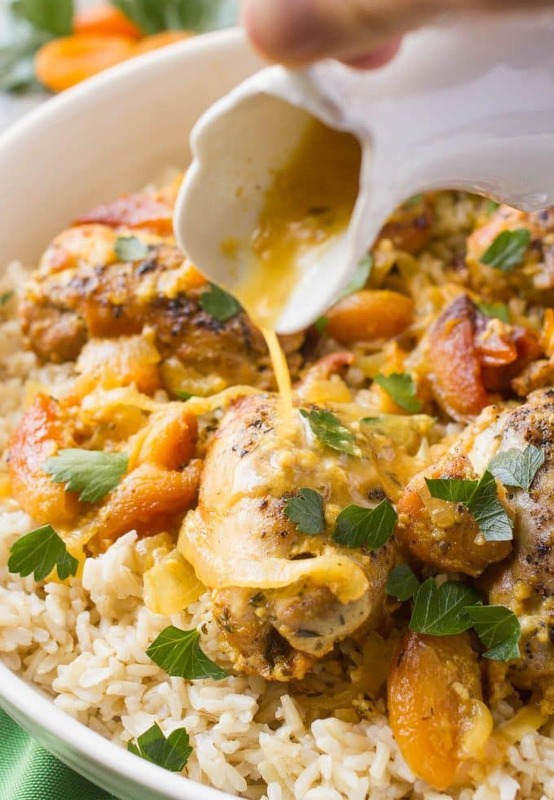 The first time I made this slow cooker apricot chicken, I had stayed downstairs for several hours after starting it, working on my deadlines, cleaning up the kitchen, etc. I finally moved upstairs for a workout and shower and when I walked out of my bedroom, having pretty much forgotten about it cooking away, I was struck with the savory-sweet smell wafting up to me. The whole house was filled with it and it was practically torture waiting until dinner time. And so I nearly burned my tongue as soon as I heard the slow cooker beep that it was finished. #nopatienceAnd happily, the taste is as swoon-worthy as the smell. The depth of flavor from the tangy Dijon mustard, the sweetness of the apricots, a quick hit of acidity from the fresh lemon juice, a shot of earthiness from the thyme and the background of savory from the chicken broth, garlic and onion… it’s a flavor fest for sure! And those onions, they are melt-in-your-mouth tender and full of the chicken and apricot flavors. The dried apricots get full and juicy and fall-apart tender as they cook. You’ll find little bits of apricot clinging to the chicken throughout the dish. Divine! Even my husband, who is not particularly fond of main dishes that have any sweetness to them, loved this. He didn’t eat many of the apricots on their own but really enjoyed the infused flavor. My main tip: Save ALL of the juices. I like to serve this over brown rice (couscous or quinoa would also be good) and pile the chicken, onions and apricots on top. Drizzle a little of the juices over the whole plate and then serve the rest of the juices at the table. My husband added another drizzle or two and I poured, poured, poured. Please don’t skip searing the chicken thighs in the pan first. I know it’s an extra step — and you know I like to take shortcuts and keep things simple — but this really helps seal in the flavor. I also would highly recommend sticking with chicken thighs. Normally, I prefer chicken breasts myself, but the thighs here offer a greater depth of flavor and heartiness that’s needed to balance the light, sweet flavors of the dish. They also retain more flavor in the crockpot than breasts do, in my experience. Any apricots that are sticking out of the cooking liquid in the slow cooker may turn brown/black. They taste fine – not burnt – but you could also simply toss those pieces. There are plenty of apricots here! I’ve cooked this on low and on high. Mine took 6 hours on low and 3 hours 45 minutes on high, but slow cookers can vary so check your meat with a thermometer to ensure the chicken is cooked through. 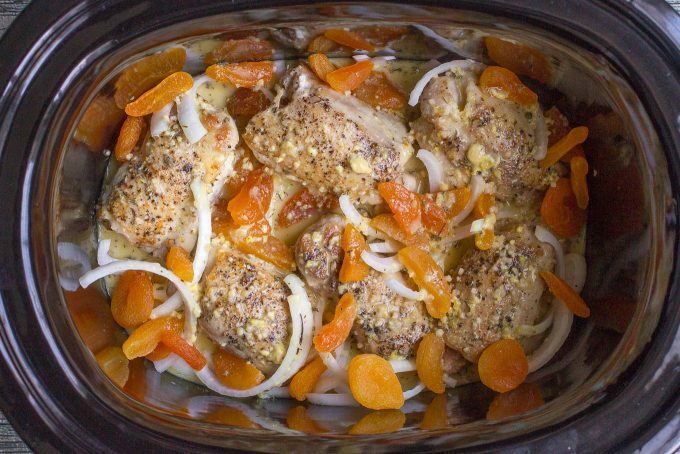 This slow cooker apricot chicken is now on regular rotation in our house. And every time I make it, I get so excited when the smell starts permeating the house. Hope you give this a try and enjoy! P.S. Check out all my slow cooker chicken recipes for more easy dinner inspiration! And be sure to check out my new VIDEO for this recipe! 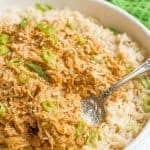 A simple slow cooker apricot chicken that has big fresh flavors and an intoxicating aroma! Season chicken thighs with salt and pepper. Add to pan and cook for 5-6 minutes, until browned, turning once. Add onions, apricots and seared chicken thighs to the slow cooker. Serve chicken thighs and plenty of sauce over brown rice or whole wheat couscous. 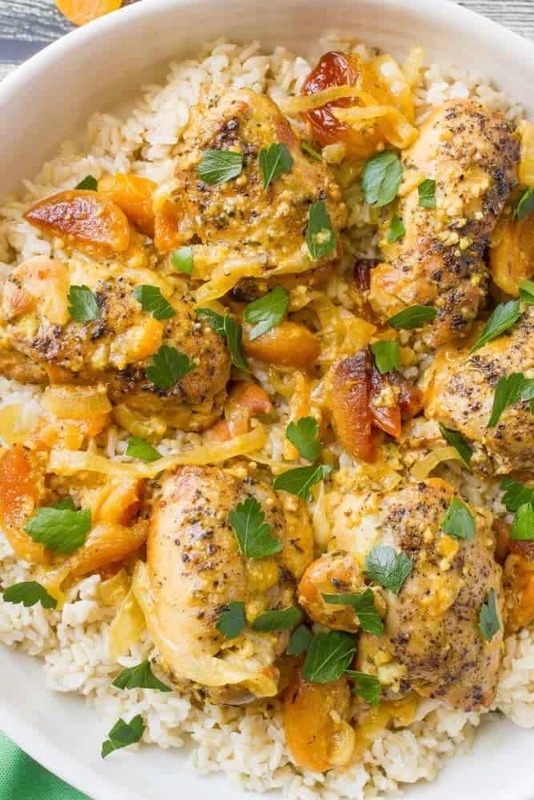 I love apricot and chicken as a combination, and this sounds amazing! I can only imagine the smell. I don’t own a slow cooker (yet) but this seems like a recipe that I could make in my tajine too! Aren’t they so good together?! 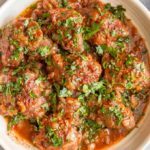 Would love to hear if you try this in your tajine – bet it would work! Sorry to hear potty training didn’t go so well! My fingers will be crossed for you guys next time you try!! That video of your daughter dancing to prince has to be THE cutest thing on the planet!!! Seriously, adorable! Now, chicken! 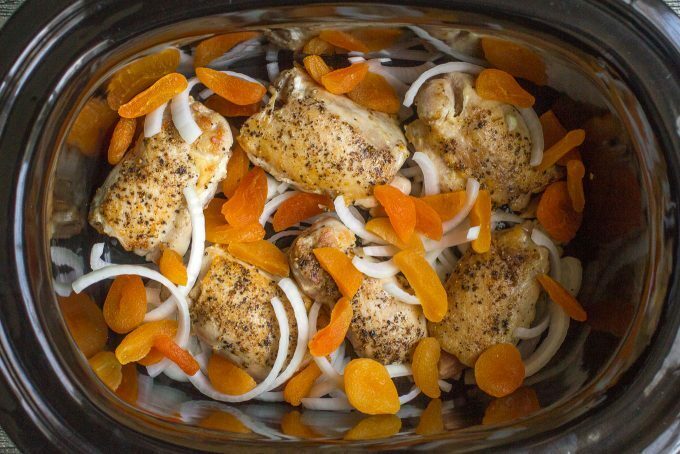 This Slow Cooker Chicken looks FAB, Kathryn!! Love love loooooove apricot, so you using it to lovingly coat chicken is blowing my mind! 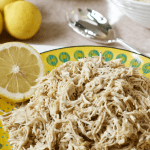 I could eat the entire slow cooker of chicken in one sitting! Pinned! Cheers, dear! Oh well, the potty training will happen soon enough, I’m sure, Kathryn!! 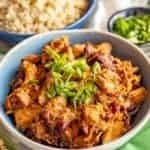 This Slow Cooker Chicken looks/sounds amazing!!! I love apricots with chicken- all that sweet/savoury combo. And how awesome of a recipe…just throw together and then get an amazing meal in no time. Perfect for those busy days. Pinning for making soon! Have a great week! We always have dried apricots on hand as a snack/treat for the kids but I’ve been munching on them and cooking/baking with them so much lately – such great flavor! Ah I saw the video you posted on Facebook, it’s so cute! Even though it’s warming up outside, I’m struggling to put the slow cooker away for the summer because I love it so much, so this recipe is exactly what I’m looking for! I’m all about apricots, and can only imagine how amazing this smells as it cooks, I would definitely have no patience and burn my tongue needing a bite asap too! Grrrr….I still haven’t bought a slow cooker so I’ll have to make this in casserole/dutch oven and a slow cooker. Loving the sweet and tanginess of this dish and the sauce and I bet it smells a-mazing. Haha, yes she did! I can’t stop cracking up over it – totally impromptu dance party and I’m so glad we caught it on video 🙂 I love my slow cooker. Such a life saver! And I’m excited to have some easy, fresh spring and summer recipes to keep using it! Oh my goodness I remember the potty training days! Good luck with that! 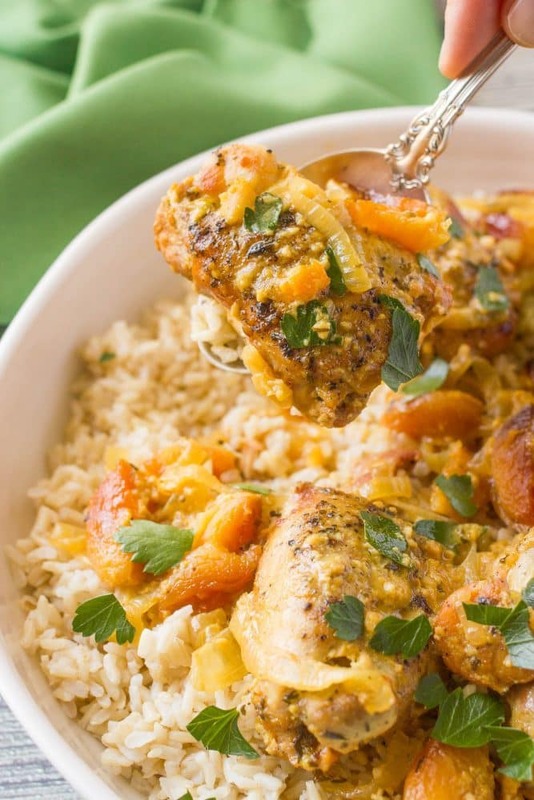 Thank goodness you have this easy chicken apricot dish that is perfect from the slow cooker! Such a tasty and pretty chicken dish! And the slow cooker makes it all the prettier! Your little man will get there…and your little lady is adorable!! You’ve shared all sorts of sweet, today! Aww, thanks Annie! Have a great weekend! I love the combination of flavors in this dish! I can see there is some serious yum action happening with the apricots, thyme, and mustard. I look forward to trying it! What a gorgeous chicken dish! I definitely don’t use my slow cooker enough. I have a package of dried apricots in my pantry waiting for a good use, and I think this will be it! 🙂 Their sweetness must be great against the zip of the Dijon mustard. Thanks Amanda! This is a perfect spring/summer slow cooker meal that’s full of flavor but not so heavy. And yes – the apricots and Dijon balance so well – hope you give it a try! This is just gorgeous! I love apricots so I can see tossing this together very soon! Looks delish and thanks for sharing on Throwback Thursday! Well this looks just fabulous! 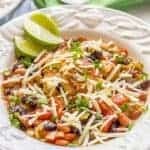 I rarely pull out my slow cooker, because I just don’t think that most slow cooker recipes out in the ether are healthy at all (so much canned soup, so much cheese!). But this is clearly different, and I will definitely be trying it out! Thanks Kirsten! I love that this is so light and fresh 🙂 I think tagine flavors would be fabulous here! Congratulations your post has been featured in this weeks Friday Favorites Linky Party!! Thanks so much Gloria – for the feature and for hosting! Have shared 🙂 Have a great weekend! What beautiful pictures. I would never think to put these two together. Sounds great! I was so excited when I came across this recipe yesterday! In my excitement (and with the distraction of a 2 year old) I overlooked that this called for DRIED apricots and bought fresh apricots 🙁 Does anyone have any idea what it would be like if I used them??? or I could use my food dehydrator and make my own dried apricots, but I’m new to it and I don’t want to ruin them! Two-year-olds are distracting like that 😉 I would suggest slicing the fresh apricots and tossing them on top of the chicken in the last hour or two of cooking so they soften and infuse the flavor a little without completely disintegrating. Would love to hear if you try it! Potty training is not for the faint of heart! Have faith though, he’ll get it. 🙂 This recipe looks amazing! 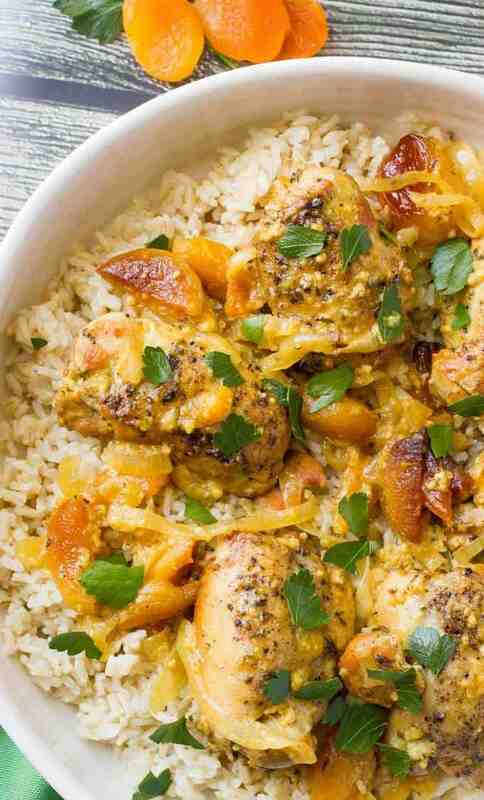 I’m pinning for later – I’ve not tried apricot and chicken together but like both I bet it’s just delicious together! Thanks so much for stopping by You Link It We Make It! We hope to see you again soon! So true, Kim, so true – it’s serious business! 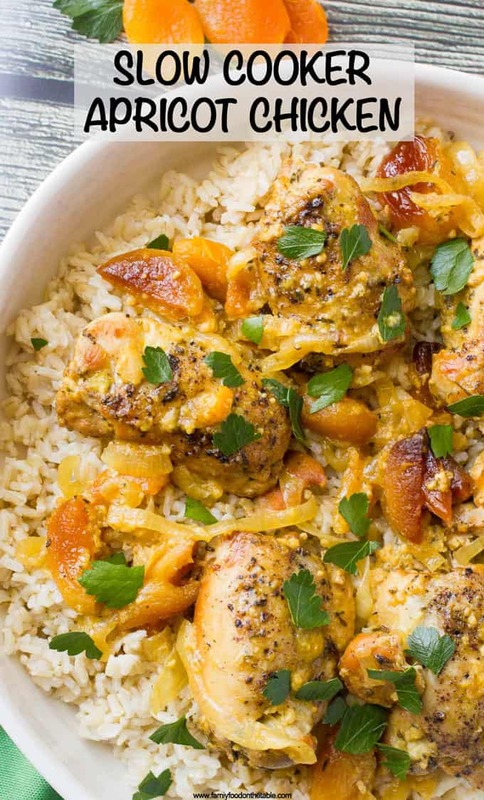 And yes, you’ve got to pair apricots and chicken – delicious combination! Thanks Angela! I hope you love it! I cannot get it either and i use it all the time.way Kathryn can you please repost? Hi guys! So sorry, I’ve just switched recipe plugins and there seem to be some tech glitches. They are looking into it now. That recipe appears to be showing up at the very bottom of the post – underneath the big Pinterest image. (Hopefully it will be moved back up soon once they figure out what’s wrong.) Sorry for the inconvenience! Any idea how this would work with canned apricots rather than dried? I’m trying to avoid another trip to the store. Hi Dana! I’m not sure… I’ve never used canned apricots but I’m guessing they would just break down completely and mostly dissolve in the slow cooker after all that cooking time, since they are soft to start with. They might leave a slight apricot flavor but it won’t be quite as concentrated as using dried. And they’d also make it a lot more liquidy. (So I’d suggest using just 1/2 cup or 3/4 cup of chicken broth if you decide to give it a go.) Let me know if you try it! Thank you for this it sounds wonderful and I can’t wait to try it. On the nutritional information it doesn’t say what a serving size is. How many,chicken thighs? how much rice?, etc. Hi Connie! 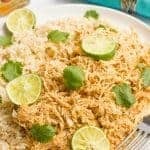 I usually serve 2 chicken thighs per person (sometimes 3 for my husband) and 1/2 cup dry rice cooks up enough to serve 2 people. Hope that helps and hope you enjoy it! This recipe was followed to the letter and it was awful will never ever make this recipe again. I’m so sorry to hear that Kaye! I’ve had great luck with this recipe and know many others who have as well. I wish I knew what went wrong… I’m happy to try and troubleshoot with you if you want to send me an email. It’s kathryn @ familyfoodonthetable.com. Hi! 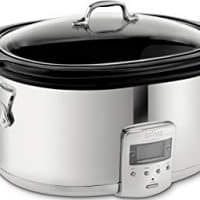 Do you have any recommendations for veggies I can add to the crock pot, i.e. green beans but really anything to make it more of healthy one pot meal? Thanks! Hi Dena! I think green beans or broccoli go great with this dish. I find a lot of veggies get too soft in the slow cooker, but you could try adding them with an hour or so left of cooking. I hope that helps and I’d love to hear what you try! Just thought I would leave a comment here because this is the second time I have looked up this recipe because it was so good the first time. I made two small changes, I used tinned apricot and less broth so there wasn’t too much liquid, and I added ginger. It is SO good. Thanks for awesome recipe. Made this tonight in the instant pot- did 20 manual setting. FANTASTIC! Tx for the recipe! I’m SO happy to hear you enjoyed it 🙂 And so happy to know the instructions for the Instant Pot. Thanks for sharing! Winner, winner, chicken dinner, legit! I added a cup of sultanas, cup of carrot, cup of celery and a cup of butternut pumpkin to the recipe. Heaven. I’m so glad to hear you enjoyed it Shane! Thanks so much for sharing! And I LOVE all those veggies you added to this – yum! What an interesting combination, it looks like a very satisfying dinner! Thanks so much – they go really well together! I just love apricots! I also love my slow cooker! It makes meals so much easier. Giving this a try today! Hope it is amazing! I work a 10 hour day (from leaving home to arriving home) can I pre-prepare this and set a timer to start? or pre prepare, refrigerate and cook on high for 3-4 hours? Hi Caroline, do you have a warm function on your slow cooker? 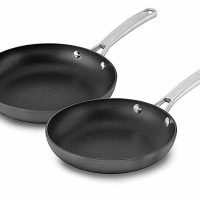 If so, you could prepare it and start it in the morning and then have it switch to warm when the cook time is done, until you get home. If not, I’d suggest pre-preparing and refrigerating it and then cooking it on high for 3-4 hours. I think it might sit too long with a delayed timer, which might not be safe from a food safety perspective. I made this recipe for dinner tonight. It smelled and looked amazing, but unfortunately it was really sour from all the lemon juice. I am going to try to make it again with just half a lemon and see if it improves. Oh I’m sorry to hear it ended up sour, Maria. Even with a juicy lemon, I’ve never had an issue with that – it usually just helps balance out the sweetness from the apricots. That’s a good idea though to start with just a half of a lemon and see how it goes. You can always add an extra squeeze of lemon juice when serving if you want to add some extra. The mix of apricots and chicken tastes delicious, and this recipe is very unusual. Thanks for sharing it!